In spite of the fact that with over 243 million internet users India spots the third position in the world, there are still 6 lakh villages in the country that have no access to internet services on their phone. And, the irony is that of those who have access to it, 69% do not know what the internet is. Anyway, the country is believed to develop a lot in the reign of its new Prime Minister Narendra Modi(NaMo) , in terms of a lot of things whether its is its digital status, literacy, or just any other thing. In this report we are going to talk about Facebook’s CEO Mark Zuckerberg’s visit to India and how he plans to collaborate with NaMo to accomplish his digital India plan and get 1 billion Indians on to the Internet offering hope to the digitally deprived. The CEO and co-founder of the social networking giant Facebook, Mark Zuckerberg said that he is actually very excited about NaMo’s Digital India programme and that when he will meet the Indian PM, will discuss with him ways to connect the country’s masses with the digital world. ”Facebook on its own cannot spread Internet accessibility. We require to work together with everyone, including the government and telecom operators to do so,” he added. He expressed that he is looking forward to contribute to the Digital India programme and help the Indian government. ”I know that Prime Minister Modi is also committed to spreading the Internet. He is committed to connecting villages online and we are excited to see how Facebook can help,” he said. India has about 243 million Internet users and 100 million plus Facebook users, he added. In fact, he announced that Facebook will sanction a $1 million fund and ask developers to build apps for farmers, migrants and women in their local language. This will be a competition to drive new apps and services in languages that people can understand, speak and write. 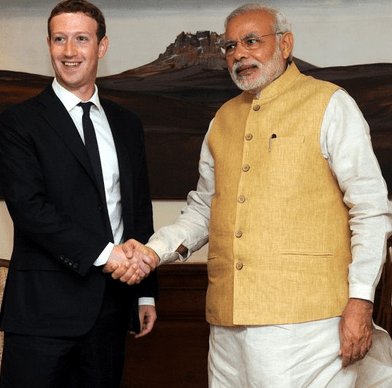 Zuckerberg, who is on his first visit to India, said that he will will be informing Modi about the Facebook initiative – ‘internet.org’ that has succeeded in connecting 3 million people to the Internet. The initiative that aims to make Internet access affordable for people across the globe and enable access to the next five billion people still without Internet, include Facebook, Ericsson, Nokia, Opera, Qualcomm and Samsung as its founding members. The partners are working together to develop lower cost, higher quality smartphones and enlarge Internet access in poorly served communities. According to Mark, Internet connectivity should now be considered as a human right to break down the social barriers.